Think Tank Photo, creator of the photography industry’s largest modular collection, has released Version 3.0 of its popular Modular Belt System, with improved access speed and ease while accommodating for today’s gear. Think Tank Photo's Modular Belt System moves weight from photographers’ shoulders to their waists for more comfortable all-day carry. Think Tank Photo, creator of the photography industry’s largest modular collection, has released Version 3.0 of its popular Modular Belt System, with improved access speed and ease while accommodating for today’s gear. 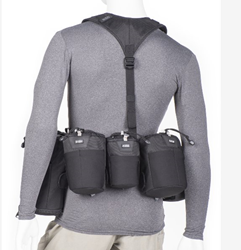 The Modular Belt System moves weight from photographers’ shoulders to their waists for more comfortable all-day carry. Many of the new pouches are expandable to fit pro-sized lenses with hoods in the shooting position. The newly added Camera Clip Adapter V3.0 belt attachment for the Peak Design Capture Clip, SpiderLight and SpiderPro camera clips allows the clip to rotate on any Think Tank belt for better workflow. Using Think Tank’s patented rotate or lock technology, photographers can lock down their pouches or rotate them freely around the belt when kneeling, sitting or running. The new Modular Essentials Set V3.0 includes four of the most popular modular pouches. Photographers get the R U Thirsty? water bottle pouch free compared to buying each component separately. The set includes the Lens Changer 50 V3.0, LC75 Pop-Down V3.0, Speed Changer V3.0, and the R U Thirsty? V3.0.